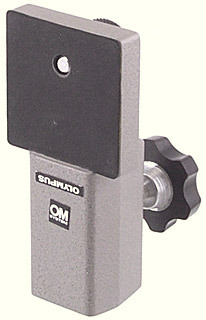 The Macrophoto Stand B Adapter is intended for connecting either the Auto Bellows or the Focusing Rail to the Macrophoto Stand VST-1. It is designed so that the centre of a lens fitted to the bellows will be located directly above the centre of the stage plate. The centre of a lens fitted to an OM body plus focusing stage plus focusing rail will also be located above the centre of the stage plate. The B Adapter fits over the top of the column of the Stand. Rotate it around the column until the flat surface is pointing forwards, and then lock it in place with the screw at the rear. The rubber-covered flat surface is the same size as the base of the mounting block on the Auto Bellows and the Focusing Rail. The ¼″ screw that passes through the flat surface screws into one of the corresponding holes in the base of the mounting block. Two versions are known. The first version, of which not many were made, has an “M” logo – see the Olympus M SYSTEM page. The later version, which is far more common, bears the familiar “OM” logo. Instructions were not provided with this item.